JA3 is a method to profile the way server and clients do their SSL/ TLS handshake. It has been created by Salesforce engineers, John B. Althouse, Jeff Atkinson and Josh Atkins. Many servers and clients use different tls configurations, making this a good way of identifying applications, libraries and their corresponding versions. Each tls configuration uses its own set of ciphers, extensions and elliptic curves. As an example, if you look at this screenshot, it shows the same JA3 signature for multiple different useragents. This means that the same tls configuration is being used within different applications, or the same application with different useragents configured. Because the Client Hello message is sent in clear, it allows fingerprinting without access to the encrypted stream. The fingerprinting works for all TLS/SSL enabled protocols. 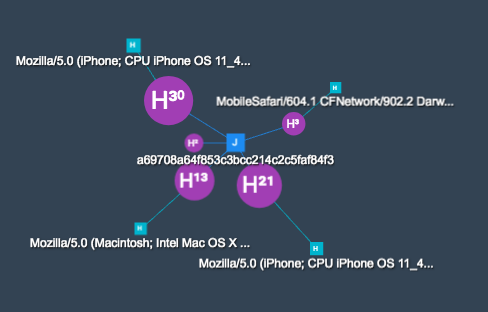 When hunting for threats, the JA3 signature can be used to correlate multiple attacks to the same tool. when omitting the Server Name Indication, you'll get a different hash. The hash is built on the extension numbers. Many applications have implemented JA3 support, like Splunk, Suricata, Bro and many more. A complete list can be found on the github page of JA3. The README contains a link to a list of known signatures and their application / library.